Here is Smart Cat Kitty's Garden. Grow oats, wheat, rye and barley for your cat's pleasure. Give your cat the tasty green grass she craves. You maywait for combined invoice. Kindly follow the directions to use. Fresh, potent catnip. Check out our Large selection of categories for Dogs, Cats,Birds, Reptiles, Fish and NOW Farm pets. Our Motto is "Good Catnip is not cheap,and cheap Catnip is not Good". You can use loose catnip to make your own catnip toys, or sprinkle a little on their food (it is good for your cat's digestive system) or sprinkle a little on the floor and watch your cat go nuts! Cosmic Refillable Catnip Toy Size 10cm (approx) Colour orange Includes genuine cosmic catnip Hours of interactive fun Easy to fill and refill . 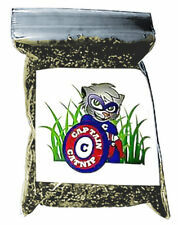 Catit Cat Grass 2.6 OZ. Just Add Water. Catnip is derived from the dried leaves of catmint, a herbal plant which belongs to the mint family. catmint has a characteristic aromatic odour which has a strange inherited fascination for all the cat family, including big cats such as lions, etc. Simple and easy to grow. Povides vitamins aids digestion and increass roughage in your cats diet. Aromatic catnip leaves to excite your cat. 100% natural. Encourages play and excercise. Has your cat lost interest in his or her toys then drive them wild with our 100% organic Catnip. Sprinkle on scratchers, toys, beds or an area for your cat to roll around in and watch them play for hours.